Before we go any further, I feel it’s important to clarify the words estimate and bid. An estimate is a calculation, opinion, or guess; a bid is an offer of a specified price, usually in writing, for an agreed-upon description of work to be performed. While estimates are useful in establishing a design and budgets, they have no value once two parties have entered a contract. Therefore, when people contact me for an estimate, usually what they really want is a bid—in writing, with a firm price—which I’ll gladly provide to you at no charge. Before contacting me, I’ll require from you a professionally-drawn, scaled plan of your project. I’ll need this plan to walk the site with you, make notes, and take back to the office to prepare an estimate. Your plan also becomes part of my written bid to you, both as a point of reference and as a legal document should a formal contract be agreed upon and signed. Please read further about plans. After contacting me, I’d like to set an appointment to meet with you on site at a mutually-agreed date and time. 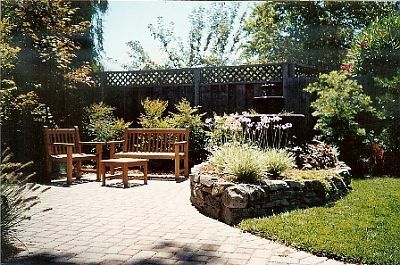 I place great importance on personal interaction because of the time, money, and energy spent in creating a pleasing landscape. You should be comfortable with your choice of landscape contractor! If you’re requesting a bid for a simple job say, replacing a lawn, a formal plan isn’t necessary. I’d be happy to measure the area and provide a written proposal.